Wish you all a very happy and healthy 2019! 2018 ended on a high note for our family. The entire summer was action packed with me becoming the stereotypical soccer mom. In our case it was cricket mom since most of our summer was dedicated to our son’s cricket class and matches. He is no Javagal Srinath yet, but he is away from electronics, spending time with other kids and is physically active. So Its a complete win as far as I am concerned. The game took over our complete summer, but it really was worth it. We moved to a new neighborhood in November and are still settling in. My son is in middle school now (boy!! They grow up so fast!!) and his work load is a lot more than the previous years. So all in all the days are over way too quickly and before I realized it, 2018 has already waved me goodbye. The new year began on a great note too as my brother and his family was visiting us over the holidays. They left last weekend and now the house feels lonely and cold. The cold part is a little too literal. It’s winter here and it’s no fun. The cold can be tolerated if you are dressed in layers, but if it’s a windy day like today, it’s very difficult. So it’s apt that I have chosen a piping hot cauliflower soup to serve you all here today. Check out the link for the original recipe from The Pioneer woman. Heat 2 tablespoons of butter in a thick pan. Once it’s melted and hot, add the onions to it. Sauté until it turns to light pink. Add the chopped carrots and cauliflower. Saute for a couple of minutes and then cover and cook until the vegetables are softer, about 5 minutes. You can add some broth or water if the veggies starts to burn or start sticking to the bottom of the pan. Now add 8 cups of broth or water, parsley, salt as needed and let it come to a simmer. Cook until the vegetables are done. In a separate pan, melt the remaining two tablespoons of butter. In a bowl, whisk the milk and flour together until you don’t see any dry lumps of flour. Add the milk mixture slowly to the butter whisking continuously. Cook till then mixture thickens. Take off heat. Carefully add the white sauce to the soup, mixing with a spatula. Let it come to a boil. Taste test and adjust the salt if needed and add pepper. Serve hot! The tea time snacks I have been bringing to the blogging table started off with a healthy cucumber sandwich. Next was a shallow fried potato and broccoli patties and now I am here with the big bad deep fried chili gobi.. And yes, it was a success because I managed to make it without any incidents. No burns, no spills, no howls from the kitchen, so that’s a definite success for me! Coming to the chili gobi here, there is it’s almost the same as gobi Manchurian. This is a little bit more on the spicier side and is not usually served as a gravy – but other than that I don’t see any difference between the two. Winter has set its foot here in US and now clicking pictures needs a bit more of planning than before. I never thought I would see a day where I would check the weather before cooking for the blog!! These were taken at 5 PM and it was already getting dark. It made me realize that I need to plan better from now on wards. 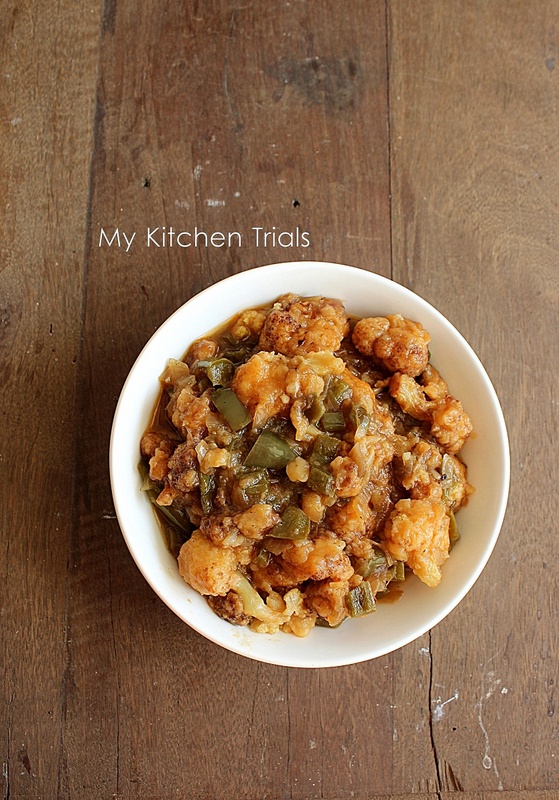 Winter is here and lets all warm up to that…with some chilli gobi, to begin with :-)! 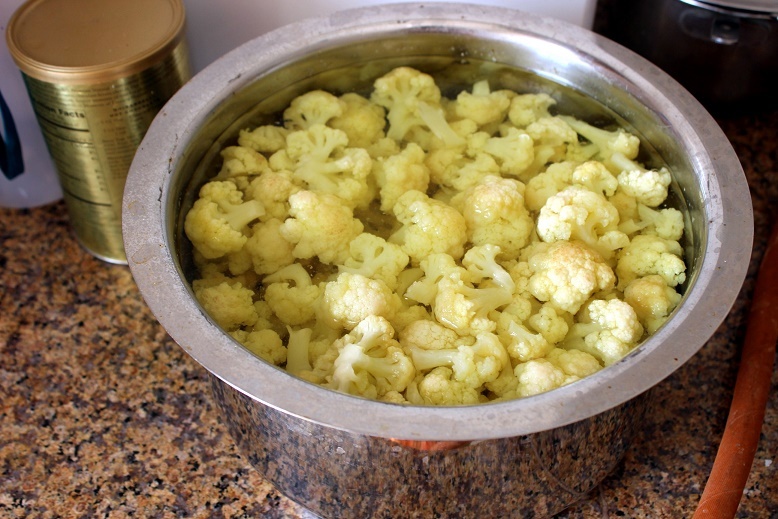 Prepare the cauliflower : Bring a pot of water to boil. Add salt as needed and a pinch of cauliflower. Add the cauliflower florets and let it boil for 5 minutes. Take off the heat and drain the water off. In a wide bowl, add 1/2 cup maida, 1/2 cup corn flour, 1 teaspoon chili powder, salt as needed. 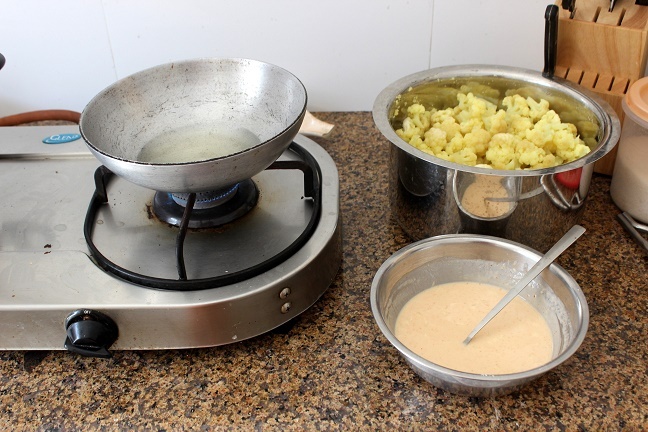 Add enough water to form a batter of cake batter or dosa batter consistency. 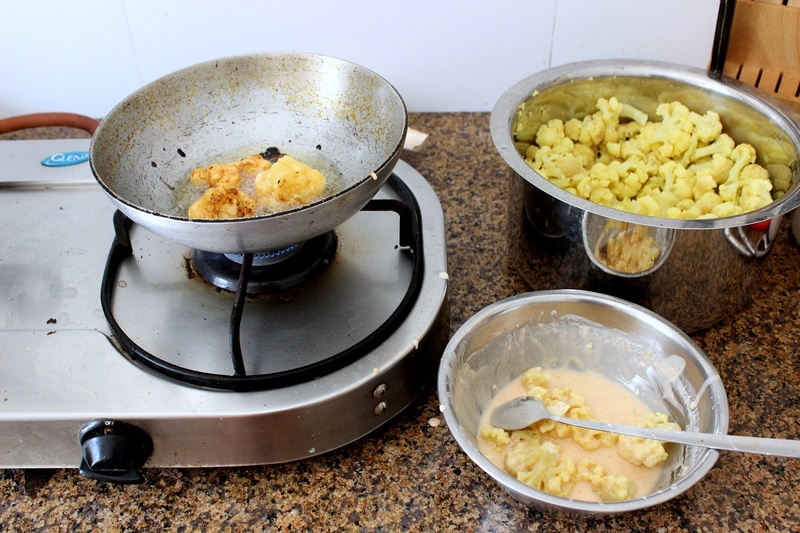 When we dip the cauliflower in the batter, it should coat it and not drain off completely. Heat oil for deep frying. Dip the cauliflower in the prepared batter and deep fry. Once all the florets are fried, set it aside. Remove all but one tablespoon of oil from the pan. We are going to prepare the sauce for the florets. 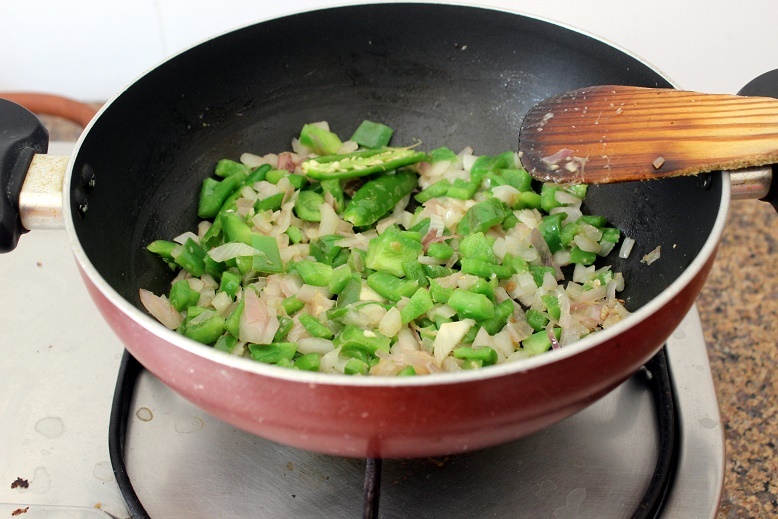 Add one medium chopped onion and 2 sliced green chilies and let it cook. Add 2 teaspoons of ginger garlic paste and saute until the raw smell goes off. 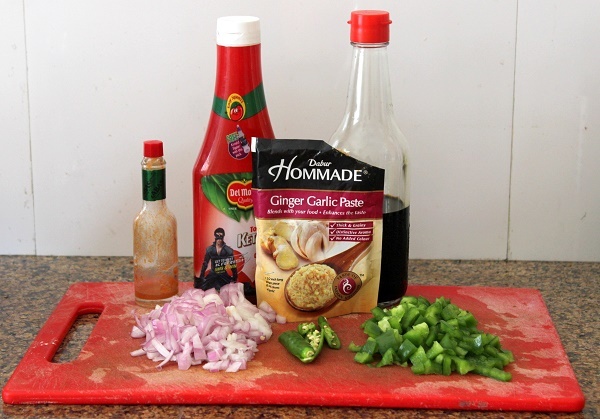 Add one tablespoon of soya sauce and one tablespoon of tomato ketchup. Tip in one finely diced capsicum. Cook for 2-3 minutes. Add 1 teaspoon (or per taste) chili powder and required amount of salt. Let everything cook together for 3-4 minutes. Taste test and adjust seasonings. Add the fried cauliflower florets and mix gently without breaking it. Take off the heat. Garnish with spring onions and serve as an appetizer of a tea time snack. Words are extremely difficult to come at times. The more so, when there is a pressure. When you really wish, hope and even demand, the ‘word well’ inside us just seem to dry up. I am trying my level best here, to write something. And I am not able to. This is funny, especially when you consider that I am quite a yakety-yak. It’s a fact that there are people who really run away or hide when they see me – cause they know I yack their head off. They know I don’t stop once I start. My friend who was staying with me, tried her level best to hide her relief when she moved out. No more midnight yack-yack-yack to listen to. Cramped her hostel may be, but there will be peace and calm when she reaches home from work now onward! Oh well! I have done it again. Four paragraphs explaining how I am not able to write on the blog! That quite makes a post by itself. 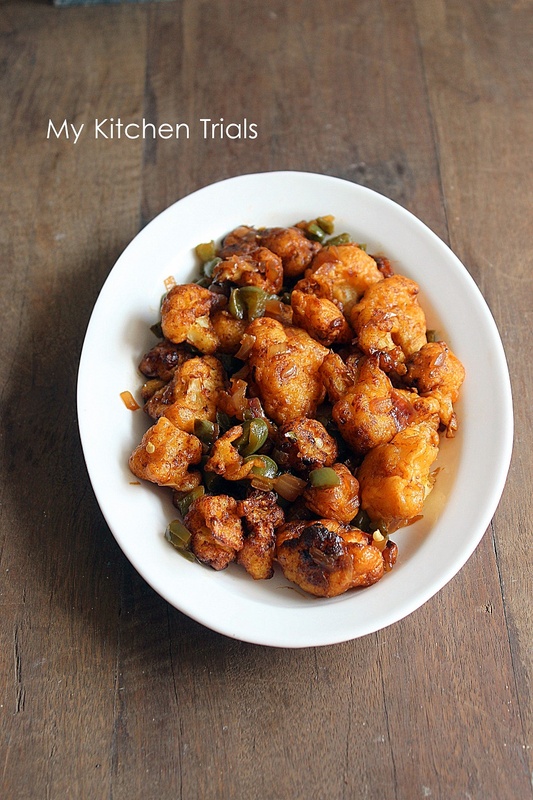 Enjoy the gobi manchurian, served with a small dose of chatter. Its the second Wednesday of the month and its time to Blog Hop! This time around, I am paired with Deeksha of Dee’s kitchen. I made her Gobi Manchurian for dinner and it got finished off in a matter of minutes. Clean the cauliflower florets and immerse them in hot water with a tsp of salt, for 5 minutes. This is supposed to clean the florets thoroughly. Drain and keep aside. Prepare the batter. 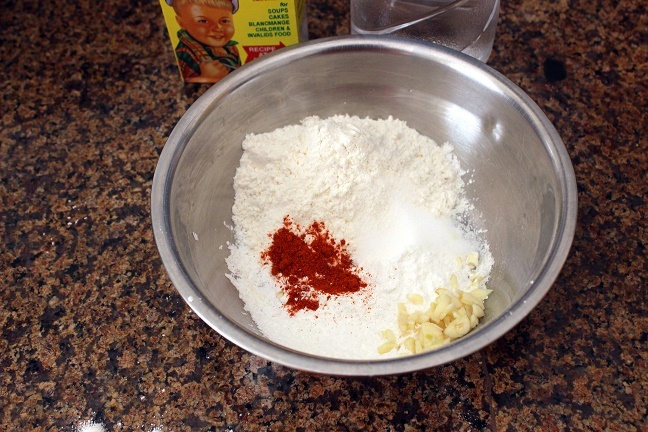 Mix the all purpose flour, corn flour, chili powder, garlic with required amount of salt. 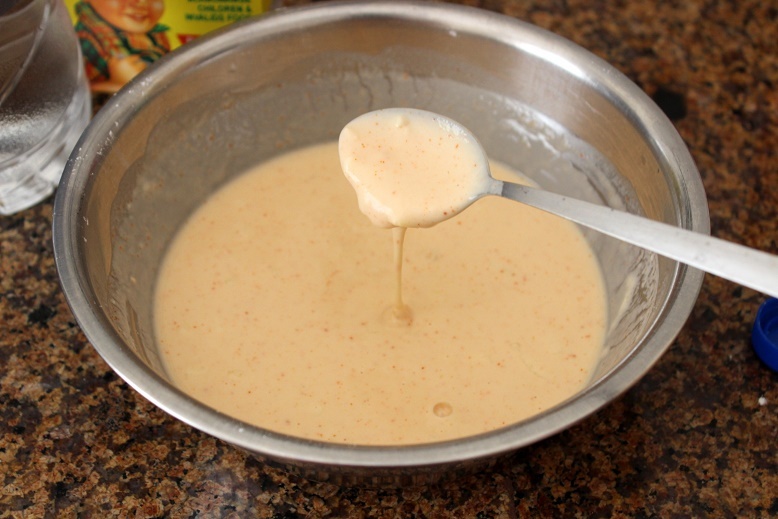 Add water in steps, starting with 1/4 cup and mixing the batter and then adding a little bit more. You want a batter with pouring consistency, but not too thin. Keep this aside. Prepare the sauce. Heat one teaspoon oil in a kadai. 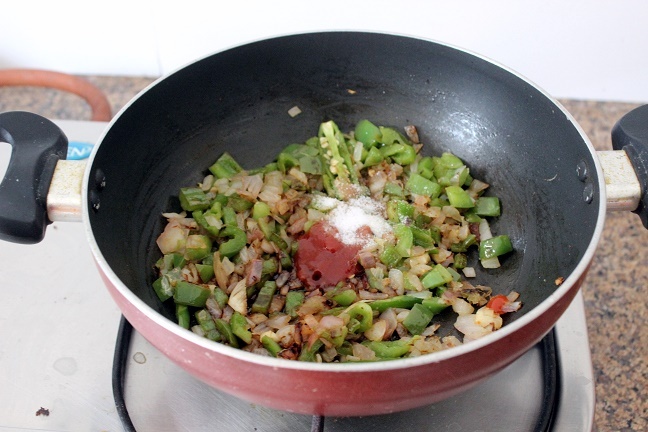 Add the onions (or the white portion of spring onion), capsicum, garlic, ginger and saute till onion turns brown, about 2-3 minutes. Add soya sauce, green chili sauce and tomato ketchup. Mix well and cook for a minute in low heat. Check and add salt as required. Take off the heat and keep aside. Heat oil for deep frying. Take the cauliflower florets, dip it in the prepared batter until it is coated fully. Deep fry in the oil. Drain in a kitchen towel. Once all the florets are fried, add it to the prepared sauce. Mix well. Garnish with spring onions (if you have) and serve hot. If you want a gravy version, add one cup of water and boil for a few minutes. It will be good if you add water just before serving. This makes an excellent starter to a meal. It also pairs well with any Indo-Chinese rice/noodles. Have you seen the movie Ratatouille? There is a flashback scene, where in the food critic Anton Ego is taken back to his childhood days when he eats Ratatouille. 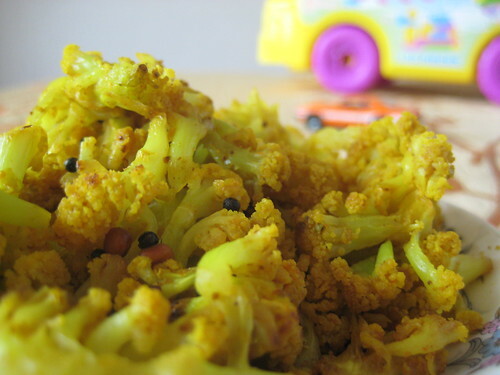 Similar to that, every time I see a dry cauliflower curry, it takes me back to the day we saw Dil Chahta Hai. Three of us were supposed to go. Me and another sleeping beauty, slept through the entire morning and left all the work to Miss M. The movie was at around 1 or 1.30 PM – So, Poor Miss M, ended up cooking our brunch, waking us up, making sure that we had food and generally seeing to it that we reach the theater well fed (we would be cranky otherwise), and on time. Our jaws dropped open when we saw that she had booked a call taxi (point to point taxi, which was a whole new thing then). Tickets were sold out by the time we reached the place and we had to buy it in black for Rs. 150/- ( three times the ticket price). When we got in, the movie had started and the first thing we saw was Akshay Khanna’s close up shot and the exclamation was “150 muthalayi” (Well worth the 150 Rupees)!!!! Now, back to the cauliflower curry. This was what Miss M had cooked for our brunch. My version is not half as good as hers, but still I keep trying. Heat oil in a pan and when its hot, add the mustard. When it splutters, add the urad dal and curry leaves. Add the chopped onions and fry till it turns transparent. Add the chopped tomato and fry till it turns soft. Add all the powders (chilli, coriander, turmeric, garam masala). Add salt and fry for a minute or two. Add the cauliflower florets and mix nicely. Fry for 4-5 minutes, stirring now and then. 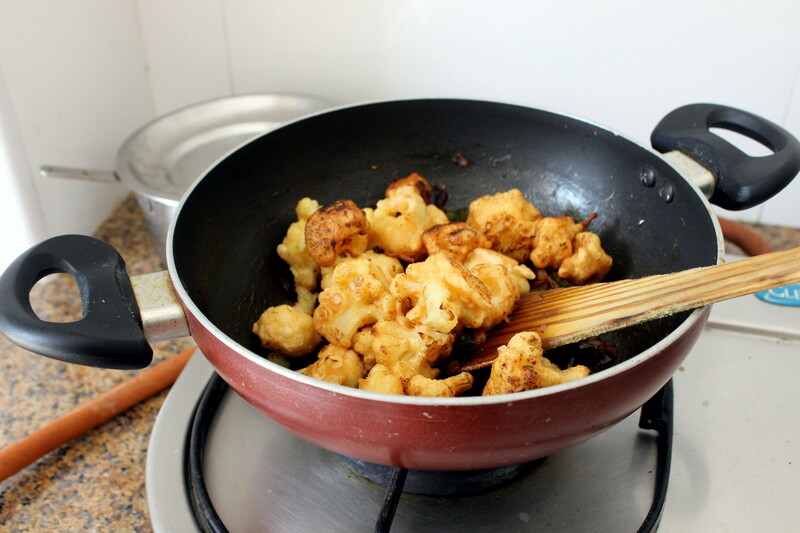 Add about 1/4 cup water, cover the pan and cook on a low flame till cauliflower is done, about 4-5 minutes. 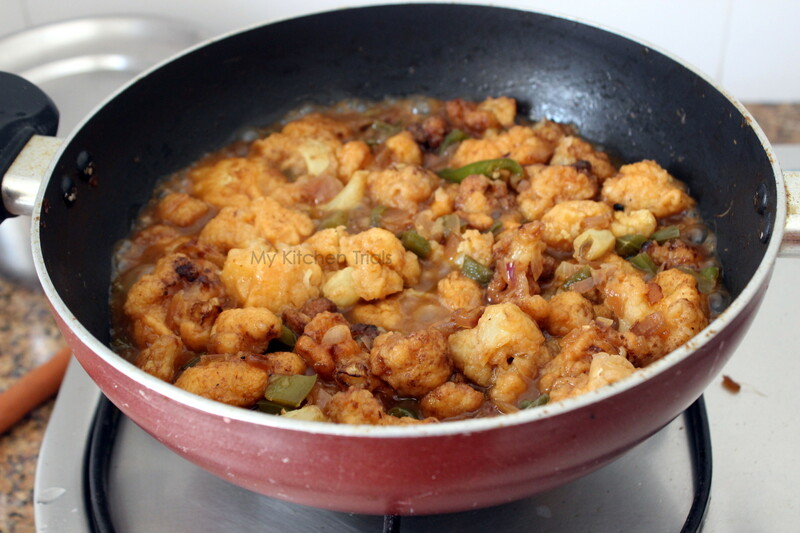 Switch off once the cauliflower is cooked and serve with rice and sambar. Cover and cook the cauliflower florets in Microwave for about 6-8 minutes. It should be cooked, but shouldn’t be mushy. Heat oil add the spices and salt. Add the (almost) cooked cauliflower and mix nicely. 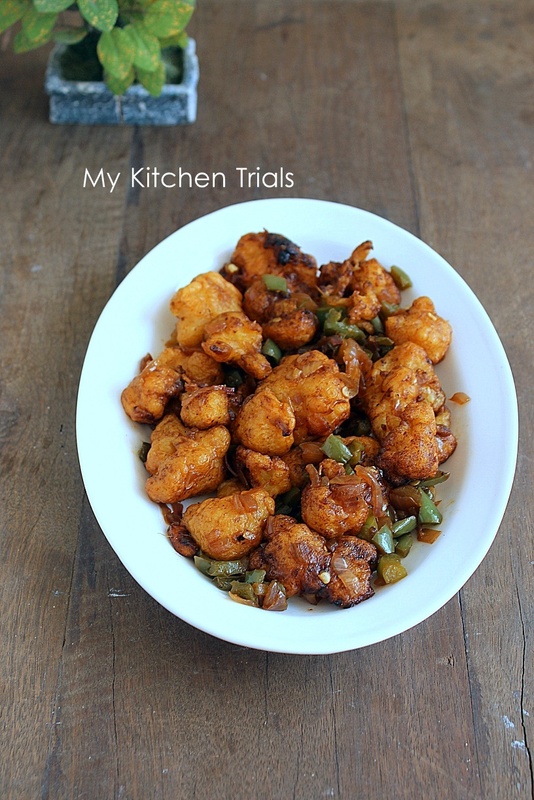 Cook for 3-4 minutes, till the flavors blend in and the cauliflower is completely cooked.